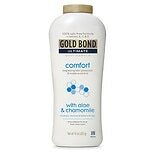 Shop Gold Bond Ultimate Comfort Body Powder Fresh Clean (10 oz. )10 oz. $729$7 and 29 cents$0.73 / oz. 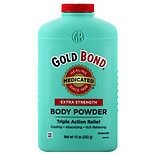 Shop Gold Bond Original Strength Medicated Body Powder Triple Action Relief (10 oz. )10 oz. 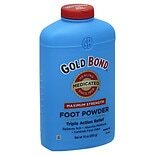 Shop Gold Bond Extra Strength Medicated Body Powder (10 oz. )10 oz. 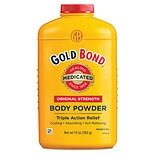 Shop Gold Bond Triple Action Medicated Body Powder (5 oz. )5 oz. 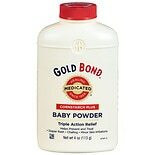 Shop Gold Bond - Children's Medicated Baby Powder (4 oz. )4 oz. 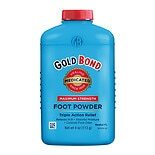 Shop Gold Bond Foot Powder (4 oz. )4 oz. 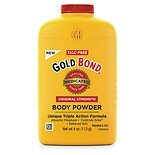 Shop Gold Bond No Mess Powder Spray Fresh Scent with Aloe (7 oz. )7 oz.